We don’t always know the people we mourn. This winter, an online message board for people with ostomies filled with comments deploring heartbreaking news from Kentucky. A 10-year-old boy named Seven Bridges took his life in January, apparently because of bullying related to his having had a colostomy. This child has something to teach those of us stunned by his death, I thought. But what? Seven was born with a birth defect that necessitated multiple surgeries, including a colostomy: a piece of the colon pulled through the abdominal wall to create what is called a stoma. Stool, moving from the intestine through the stoma, collects in a pouch attached to the belly. News reports said that Seven had the procedure reversed but continued to have trouble with leakage. His parents, Tami Charles and Donnie Bridges, told reporters that resulting odors triggered classmates’ aggression. More specifically, they say that schoolmates subjected Seven, who was African-American, to racist insults and choking. They had lodged complaints with the school and were looking forward to his making a fresh start in a new school for the sixth grade. But the damage took its toll before he had a chance to try: He hanged himself. It is impossible to register the horror of that event. Children with disabilities are often targeted by bullies. What courage Seven must have evinced in his elementary school years, I marvel while recalling how disoriented I initially felt living with a stoma. An ostomy abrogates our fundamental assumption of bodily autonomy. I was 64 when ovarian cancer necessitated an ileostomy, an operation involving the small intestine. The act of excretion could no longer be controlled. Evacuation occurs incessantly, from the front of the body. What should be inside and hidden — a bit of intestine — is outside and visible. Learning how to clean myself and replace the pouch required the supervision of a home nurse. I dreaded leaks. Wasn’t I too well schooled to be ashamed of a medical intervention that saved my life? No, not really. Self-loathing had me in its grip. Although hidden beneath clothing, the stoma made me feel defective. Even if Seven had found strategies to mitigate the self-shame that clamped down on me, the shame inflicted by others would have been appalling. Shaming is most effective with those liable to internalize it. Bullies frequently target schoolmates who have labored against feeling humiliated by whatever difference might mark them: looking fat or skinny, short or tall, foreign or queer. All sorts of differences must be negotiated by all of our children at their, and our, peril. Seven’s story discloses the vicious vise of shame and the need for resources to escape it. Instantly I go into didactic overdrive. Younger and older patients should be encouraged to meet periodically with mentors — ostomy nurses (bless them!) tend to be brilliant, but seasoned patients as well — who can assist with the physical, psychological and social trials that arise. Seven Bridges did not have the time to discover that the longer one lives with a stoma, the easier it becomes … partly because of the information, advice and camaraderie now available online. After notices of his death appeared on news outlets, teens and young adults who had undergone ostomy operations began conveying their condolences and promoting body acceptance by recounting their own struggles with shame. 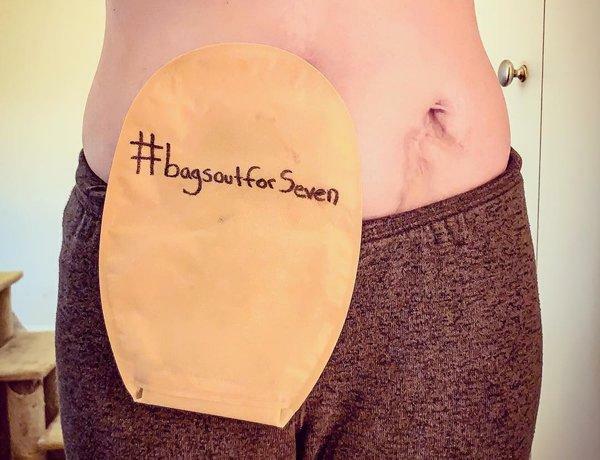 On Instagram, under the hashtag #BagsOutforSeven, some shared photos of themselves with pouches. Their brazen dignity rebuffs not only stoma stigma but also the practice of stigmatizing any sort of physical difference. They undoubtedly realize, as I do too, that we are all so much more than our embodiment. Let’s commemorate Seven Bridges for his transmission of obdurate truths with which we must contend. His parents honor him with their traditions, as I seek to honor them with mine. May his memory be a blessing.